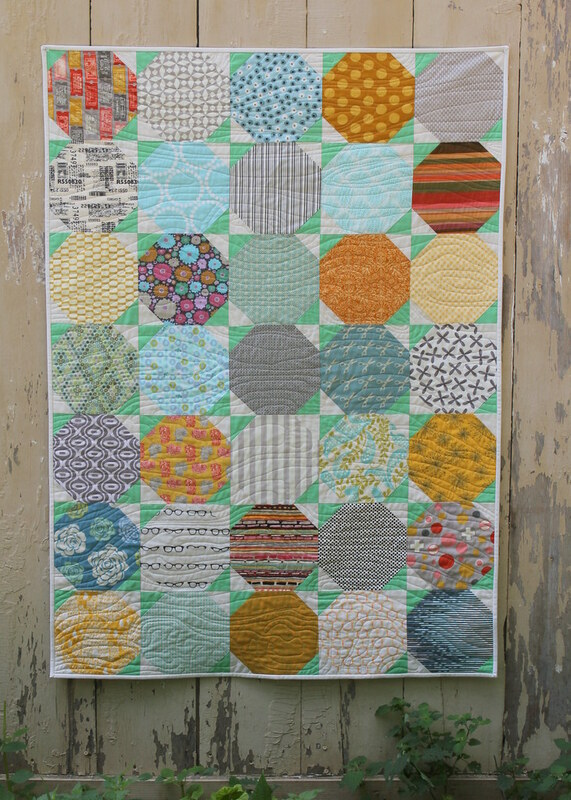 Modern Quilting by B: Single Block Quilt Tutorial Series - Snowball - Part 5, All done! 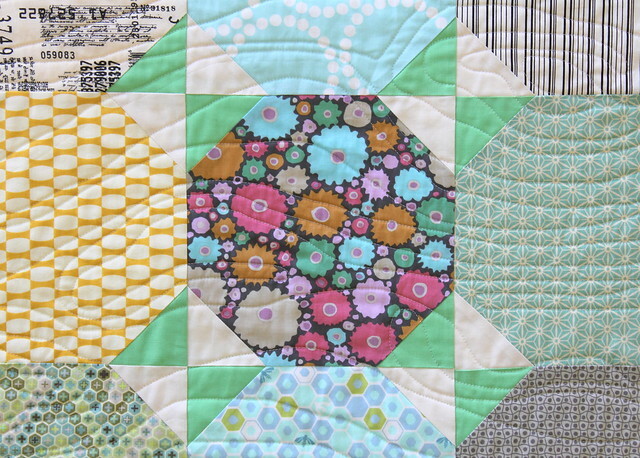 Single Block Quilt Tutorial Series - Snowball - Part 5, All done! This isn't your grandmother's snowball quilt! It's a large scale, modern beauty that took just a couple of days to make. Grandmother's would have been made of much smaller blocks, probably wouldn't have been as scrappy and definitely wouldn't have been rotary cut, machine pieced and long arm quilted. Our fore-quilters would be so surprised, and pleased, to see how far our favorite craft has evolved. This quilt was made step by step, in accordance with the previous four parts of this Single Block Quilt Tutorial Series posted earlier. Initially, I had planned for the palette to be aqua, yellow and gray, but it seems that I let a little pink, orange and green creep in. Pressing seams in the directions as indicated in the tutorial was very helpful when combining blocks to assemble the quilt top. 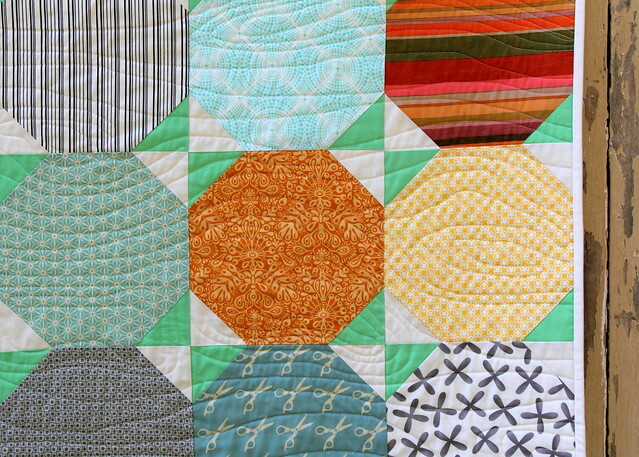 Avoiding overlapping seams to reduce bulk goes a long way toward making a quilt look crisp. I used my long arm to quilt a topographical pattern. I had never done this before, actually, I had never even seen topographical quilting before but I'm very pleased with how it turned out. The stitching is not very dense therefore taking little time to complete and leaving the quilt quite supple and comfortable. Kona Solid Cotton fabric in Snow was used for the binding, completing the project. It's all done! I hope that you've enjoyed this tutorial. I certainly enjoyed writing it. I'd be pleased answer any questions you may have. Just post a note in the comment box. I didn't see a pattern/instructions. I was wondering what size each block is. This looks like a nice lap quilt to make. 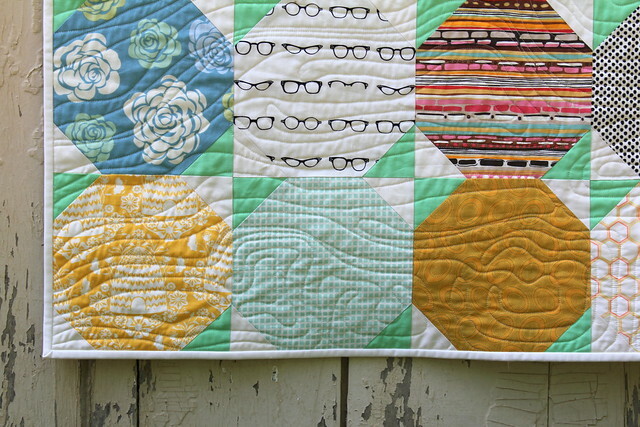 I love how you quilted this! 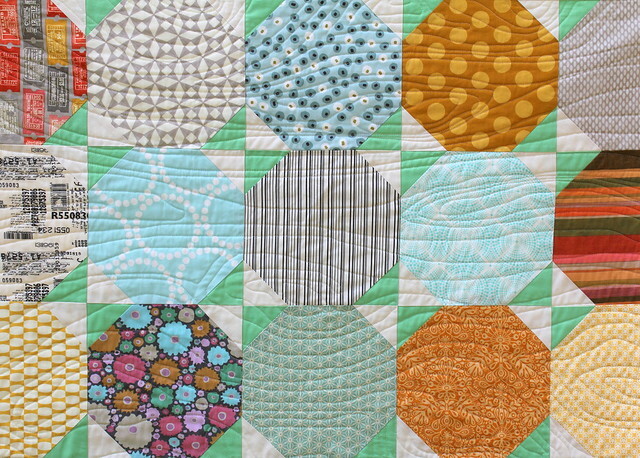 The wavy lines really set off the snowballs, and compliment the entire quilt design. Can't wait to try it myself! What a fun idea! Thank you for the tutorial and for sharing!